Car entertainment systems are no longer exclusively luxury add ons. Several minivans and SUV manufacturers routinely offer these systems as part of an entertainment package when purchasing a new car. For older vehicles, retrofitting the interior for entertainment systems is common. Aside from the obvious entertainment value of a car video system, there are other benefits to having one installed. For instance, many video systems allow drivers to attach GPS systems for navigation into their video display systems, giving them hands-free access to maps and navigation tools. Next, rear cameras can be integrated into the system to aid in backing up and parking. Finally, as video systems become more prevalent in SUVs and minivans, car buyers expect these systems as standard features, so having one built in will help to maintain a car’s value later in time. The most practical video system for a vehicle is an in-dash system that is mounted on the front dashboard. This allows easy access to all the controls and is particularly helpful to drivers who have integrated cameras and GPS systems into the entertainment unit. In-dash video systems typically come with a small 6 to 7 inch LCD monitor that fits in the middle of the front dashboard. Attached to the LCD screen is a receiver base that controls all of the operations for the video system. When picking an in-dash system, it’s important to choose one with DVD capabilities so that the video screen can double as a DVD player for entertainment purposes. 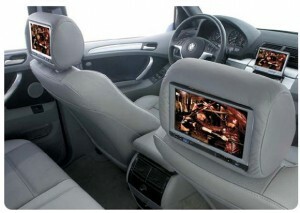 One thing to look for when shopping for in-dash video systems is multi-zone capability. Simply put, multi-zone capability allows the receiver to broadcast video and audio to other monitors throughout the car. For example, the in-dash display up front could be showing information from the GPS system while simultaneously playing a DVD movie for passengers in the backseat. For those wishing to install an entertainment system in the backseat of the SUV or minivan, there are several options available. The first option is to install headrest monitors. These small monitors range in size between 5 and 7 inches and are installed directly into the front headrests. These monitors can then be hooked up to DVD players or gaming systems that can be stored under the seat or in a central console unit. 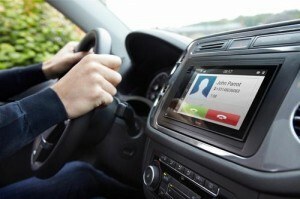 They can also be integrated into a multi-zone, in-dash, video system. Many of these systems have wireless headphone capabilities, which allow passengers to watch movies without distracting the driver with too much noise. Another popular option for backseat viewing is the fold-down monitor that is attached to the roof of the car. These fold-down systems require professional installation. These monitors allow for better viewing by all of the passengers in the vehicle since they are centrally located. Also, they can fold up and out of the way for convenience. Another benefit of these systems is that DVD players are often built into the unit, which saves space. These systems usually have A/V inputs that allow passengers to attach other audio and video equipment like gaming systems and even laptop computers. Like headrest monitors, most overhead systems have wireless headphone capability.